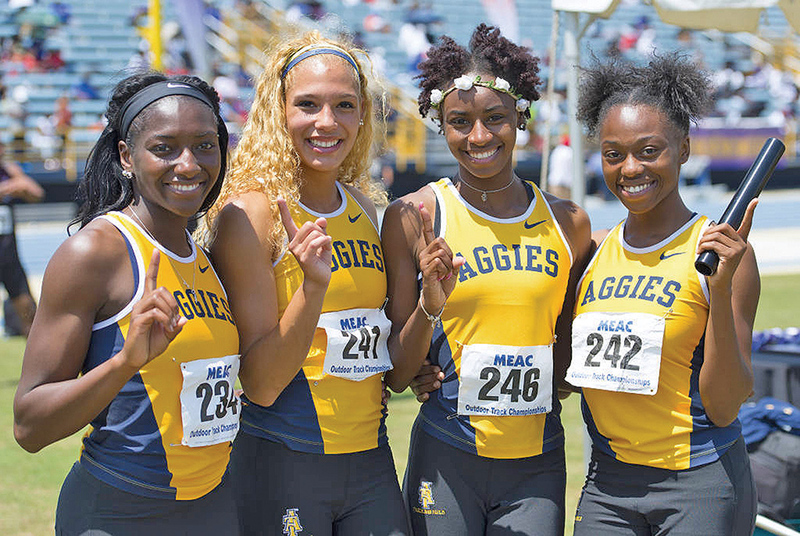 On the final day of the 2016 MEAC Outdoor Track and Field Championships, the North Carolina A&T State University men’s and women’s teams broke two MEAC records with a home track advantage, lowered two A&T records and set several personal records on the Irwin Belk Track. It was an incredible weekend for both Aggie teams even though team titles went elsewhere. Bethune-Cookman had to score a whopping 151 points to outlast the Aggie men who posted 134 points. Meanwhile, the women went into the conference championships with only 13 athletes and yet scored 104 points to finish fourth behind champion Florida A&M (164 points), Hampton (139) and Bethune-Cookman (106). The common denominator in all the record-breaking triumphs was A&T’s Christopher Belcher, a recent transfer student from Sayville, N.Y. Belcher put to rest a 35-year-old MEAC record with his 10.07 second sprint in the men’s 100 meters to claim the title. The previous record, set in 1981 by FAMU’s William Haynes, was 10.23 seconds. The 10.07 also set a new A&T record, which was held at 10.11 by junior Maurice Eaddy. An Aggie male has won the 100m in six of the last 10 years including the last three (Desmond Lawrence-2014, Caleb Gabriel-2015 and Belcher-2016). In the 200m, Belcher erased a six-year-old school record held by Calesio Newman. The transfer marked a 20.39 to overthrow title-holder Newman’s 20.59 time. Several other Aggies also showed that they were top-performers in the MEAC. The women’s 4x100m team came very close to breaking the MEAC record, which sits at 44.93 seconds, with their 44.96 run. Freshmen Yakira Love, Kayla White and sophomores Morgan Knight and India Brown all earned first-team all-conference in the event and scored 10 points for the ladies. This same group of ladies also scored numerous points individually. Brown continued her brilliant sophomore campaign. After winning the 60m and the 200m during the conference indoor championships, she took individual gold in the 100m and the 200m with marks of 11.50 and 23.75 seconds respectively to bring in 20 individual points. Knight championed the women’s pole vault as she propelled 11-feet, 5 ¼-inches for 10 points, and she earned second-team all-conference in the 100m hurdles with a 13.69 second sprint which earned eight points. White won the 100m hurdles for her third MEAC track individual title of the season as she finished in 13.52 seconds. She also garnered eight points and second-team honors in the 200m with a time of 24.2. Pushing themselves to the max, there were even more Aggies who set personal records on the day. In the men’s 400m, sophomore Dajuan Harding gained third-team honors with a 46.14 second run that beat out his previous 46.99 personal record (PR) and freshman Justin Hamilton placed fourth in the event with his new PR of 46.66, down from 47.08. Rowe set two PRs on the day, lowering his 100m to 10.39 and taking third-team honors, while also reducing his 200m PR to 20.93 for second-team honors. Sophomore Steven Stowe had a PR of 4:03.83 in the 1500m, which landed him sixth and Love had a PR 11.84 in the women’s 100m that took fourth. As the only middle distance runner, sophomore Imani Coleman ran a PR of 2:13.91 in the women’s 800m and gained five points. She finished in fourth place. Freshman Anisa Toppin found a triple jump PR of 39-feet, 10 ½-inches that obliterated her previous best of 38-feet, 1 ½-inches.